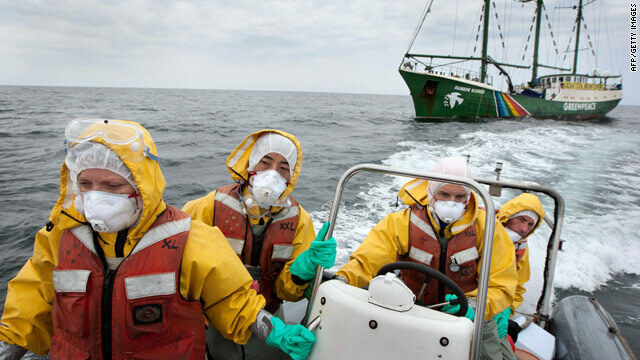 A Greenpeace crew tests waters off Japan for radiation contamination earlier this month. Radiation from Japan's damaged Fukushima Daiichi nuclear plant is accumulating in marine life off Japan's coast above legal limits for food contamination, Greenpeace said Thursday. The environmental group said its findings run counter to Japanese government reports that radiation from the Fukushima plant, damaged in the March 11 earthquake and tsunami, is being diluted as time passes. “Despite what the authorities are claiming, radioactive hazards are not decreasing through dilution or dispersion of materials, but the radioactivity is instead accumulating in marine life," Greenpeace radiation expert Jan Vande Putte said in a press release. Greenpeace said its teams collected samples of marine life along the Fukushima coast and in international waters outside Japan's 12-mile territorial limit. The samples were tested by nuclear research laboratories in France and Belgium, and high levels of radioactive iodine and cesium were found, it said. Fish, shellfish and seaweed all showed significant levels of radioactive contamination, according to Greenpeace. All are widely consumed in Japan. Besides consumers, fishermen are at risk from the elevated radiation levels, Greenpeace said. “Ongoing contamination from the Fukushima crisis means fishermen could be at additional risk from handling fishing nets that have come in contact with radioactive sediment, hemp materials such as rope, which absorb radioactive materials, and as our research shows, radioactivity in fish and seaweed collected along Fukushima’s coast,” Wakao Hanaoka, Greenpeace's Japan oceans campaigner, said in the statement. The Japanese government has evacuated nearly 80,000 people from areas within 20 kilometers (12.5 miles) of the plant to reduce their radiation exposure. Tens of thousands more may be moved if an exclusion zone is widened to reduce long-term radiation exposure. Officials from Tokyo Electric Power Co., which owns the Fukushima plant, said last week they expected an end to the nuclear crisis by January. But utility officials said this week that two of the reactors at the Fukushima plant may be riddled with holes, which would hamper plans to cool the units and bring the crisis to an end. While no deaths have been attributed to the Fukushima Daiichi accident, the earthquake and tsunami have killed nearly 15,000 and left 10,000 more missing, Japan's National Police Agency has reported. Show me a fish covered in eyeballs, or greenpeace lies. Unfortunately it is not oil slick you can see and estimate the damage. The fears from radiation are not unfounded. Unfortunately, Greenpeace has no credibility when it comes to radiation. They are good at fostering hysteria however, and that's what we see here. If you are interested in factual information about radiation and health, there are plenty of reputable sources; Greenpeace certainly IS NOT one of them. What about the labs in Europe that supposedly did the analysis? Are they just fostering hysteria? This is something anyone with a big boat, and the time to waste, could verify, so it doesn't make much sense to slam Greenpeace. Now, they might exaggerate the level of contamination, but if a lab says it's 10 times over the limit, it's probably 10 times over the limit, don't you think? Yeah, TEPCo is who we should be listening to, right! They have been honest with us from the beginning! We need more corporations like TEPCO to tell us how safe the radiation is and that everything is AOK! Right TEPCO, I mean Alan? i for one wish someone would put some uranium ore in a sample thats to go to the gov. just to see if it comes back 'all good, no cause for alarm'. Yes what about those labs in Europe? The accident happened March 11, iodine has a half life of 8 days so the levels of iodine would be effectively zero by mid May. So how can the labs in Europe detect high levels of an isotope that would have already all decayed? Makes you wonder doesn't it. And why aren't we getting numbers instead of "high levels"? Tell us the numbers and the limits and let us compare them. Or would that allow us to see that the levels aren't 'high'? So you think people would die of deformities and cancers anyway? On a positive note, it should make Godzilla's fire heat back up. That way he'll be readier if Rodan or Ghidorah get feeling froggy again. You have to wonder how many thousands of people will eventually develop cancer because of this. I think they are still having birth defects from us dropping the bomb on them back in the war. You may be right about the cancer thing. we will know is 10 years, until then lets all pretend its not happening , right TEPCO? Well Jonathan Belllew you would be wrong. There was an increase in birth defects among exposed women who were pregnant at the time of the bombing, and there has been an increase in leukemia among the bomb survivors. But there has been no increase in birth defects among children concieved after the bombing and no increase in cancer among children (now adults) concieved after the bombing. Maybe you would be better served by facts rather than your unfounded beliefs? Because there is a time delay between when a person starts consuming tainted food, to the time it's discovered, these radioactive nuclides have plenty of time to get to work on people, especially if anyone is not honest to the public about the levels of contamination, or, if they don't do a really good job of monitoring the foodstuff. Nuclear plant workers nonchalantly monitor themselves for contamination because of complacency and routine, and with seafood, the creatures own flesh could potentially shield the radiation and pass as good. I wouldn't consume anything that came from that area, and I mean ANYTHING. Well said. You could ingest Plutonium even and not know it. Not all radiation can be easily detected. Thanks TEPCo for being such a concerned corporation and bringing out the information in such an expedite manner! You really show how concerned you are for our children and families! You are a pillar of hope and proof that greed is just for the mafia. But wait, the "experts" said we were all going to be fine. The "experts" said that the nuclear plant had just hiccuped that it was no meltdown. I knew what happened from day one! Yep, we all know that anyone trying to save the planet from systematic environmental destruction is pure whack job. Sounds like all we need is enough hemp to absorb all that radiation. It is funny that the articles that are serious have all the comments filtered before posting. No censorship here. This will not end in January. Chernobyl is still "cleaning" up. Note that human beings have never built anything that cannot fail. All nuclear plants can and will fail, there is no other possibility. It is why I am opposed to nuclear power, we are just not capable of providing it safely. I remember the fear of nuclear bombs, looks like nuclear power plants, so numerous, are the true threat. So you are opposed to cars and planes and boats and microwave ovens, right? In fact unless you are a hypocrite you must be afraid of the computer you typed your comment on.